The Chessman Area is a sprawling collection of more than 50 routes. While climbs were established as early as 1979, the crag really blossomed in 2008 when Eric-Fazio Rhicard and Jim Scott started developing the area. The Chessman Area makes for an easy day of cragging due to its low elevation and proximity to the road. It has the opposite aspect of windy point. The main walls have shade until approximately 2pm. Pawn & Chessapeak: The Chessapeak Wall, which is the south face of the Pawn, contains ten routes ranging from 5.6 to 5.10-. A number of the routes are traditional or mixed. Additional routes such as Hour of Power and The Phalanx are in the vicinity. King: Thirteen traditional and sport lines ranging from 5.9- to 5.12+. Serf's Up (5.12-) on the Rampart and Kings Arete are classic. This area includes the King's Rampart sector. Checkerboard: Five sport and mixed routes ranging from 5.8 to 5.10. Queen: Five routes, one of which is gear protected, ranging in difficulty from 5.10 to 5.11+. 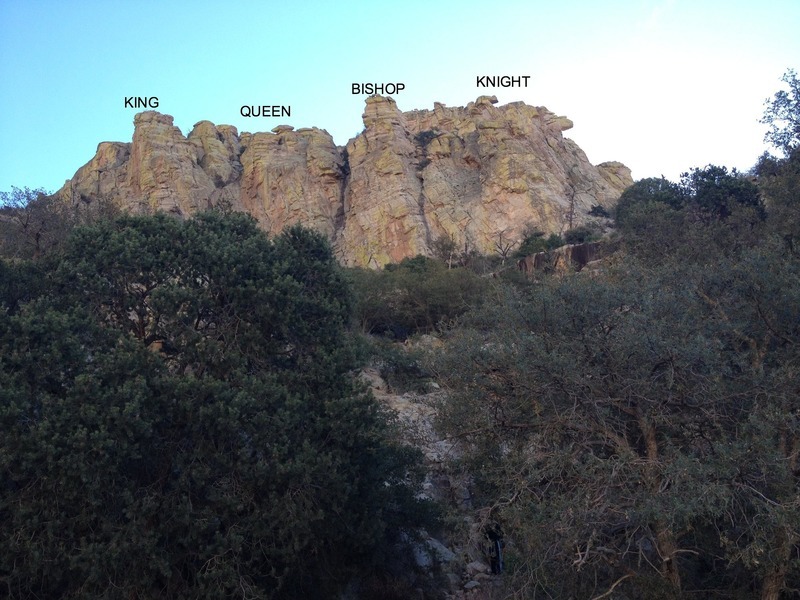 Two Kings And A Pawn is a Mount Lemmon modern classic. Bishop: One gear, one mixed, and five sport routes comprise this sector. Grades range from 5.10- to 5.12-. Heelium and Flogging The Bishop are popular 5.12- lines. Nuts And Bolts is two pitches, the first of which is mixed. Knight: The six front-facing, sport lines range in difficulty from 5.10 to 5.11. Knight Owl and Knight Maneuvers are considered the best. The four traditional and mixed lines on the south face are 5.6 to 5.9+ and all are R rated. Lorax & Ball Return: Nine routes ranging in difficulty from 5.9 to 5.10+. Some are gear and some are sport. One Day Wall: Seven moderate sport and traditional routes with difficulties ranging from 5.6 to 5.9-. 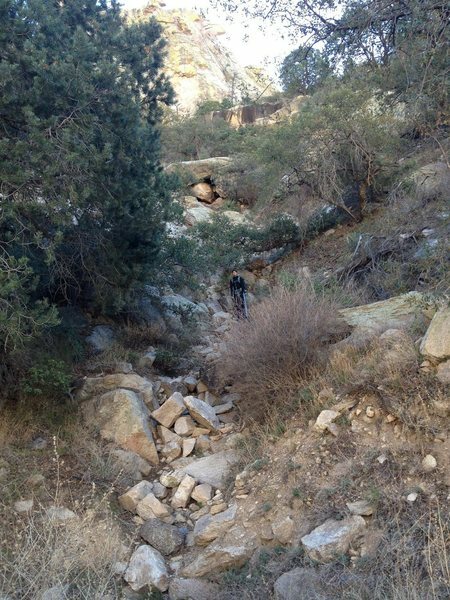 When driving up the Mount Lemmon Highway pass the Seven Cataracts Vista, continuing a quarter mile. At approximately mile mark 9.4 park in a small, tree-lined pullout on the right that has a drainage. Disembark and hike straight up the rocky drainage for approximately 15 minutes. The strenuous hike involves a small amount of scrambling but is over soon enough. A fork near the cliff divides the Queen and Bishop sectors. The former is reached by the left, uphill fork; the latter by the right, level fork. This is also the currently accepted approach for the Pumphouse and the Andy Cook Wall. Aleix Serrat-Capdevila on the King's Crystal 5.12. Somewhere in the Super Mega Secret Area! Placing gear on the upper part of the seam. Joe Lee on the classic 11-, Two Kings and A Pawn. "Don't worry, I have you on (hip) belay"
Jim and Erica Nappin' on the ledge of the Rampart. Hehe If Eric M's post from 5 months ago doesn't spell it out enough, I don't know what would. The secrete will be revealed as soon as the Isolation Canyon lads do a topo and tell people where that area is. Is it up there on the wall next to the thin seems with the orange rock? You know the one that starts above the ledge with the bushes? You know the one with the carabiners and quick links at the anchors. A little more info would help. Except for the chain draw you just described half a dozen routes there. You might start by looking at the overhead in SQ II on page 44 so you know if you were on the Queen or not. The 11- just left of Flogging the Bishop/Heelium??? (ie far left end of the Bishop). Don't believe those two share a start but it could certainly look that way at first glance. Can't remember whether it had a chain draw for cleaning or not, but since it leans left the whole way, would make sense if it did. Tyler, everyone, but you I guess, knows where the chessman is now. We originally posted it as a "super secrete area" as a tongue and cheek response to the Isolation Canyon developers. They posted loads of pics but kept the location secrete for quite sometime. Anyway the first pullout on the right about a quarter mile past the 7 Cataracts Vista parking area is where you park for the Chessman. Just follow the drainage and trail straight up from the pullout. Lots of good climbs of all grades. Stays shady till 2:00 or so this time of year. So go late or wait for a warm day. Thanks there Jimbo... not from here. Just lookin to climb while Im out here and found the description for this area obnoxious.